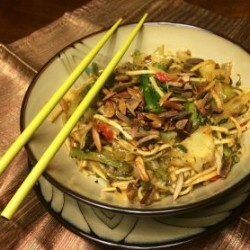 While the key to a fabulous Chinese stir fry is definitely the flavorful Szechuan sauce, the mixture of vegetables, nuts, and protein you assemble creates a different meal each time you make it. All the better if you can include what’s fresh and in season from your local farmers’ market, which was how today’s dish came about. While I was intially inspired by the gorgeous yellow squash and red bell peppers of summer, dinner was taken to a whole new level by the crisp Chinese broccoli I happily stumbled upon at the Hmong stall, which offers traditional Asian crops. And, though I’m calling this a “summer” stir fry, you can certainly get these vegetables any time of year; regular or baby broccoli can be substituted if you can’t find Chinese broccoli. 1. Prep the veggies. Long strips work well in a stir fry, in my view, but you can use a large chop if you prefer. Also pictured are onions (included in any of my stir frys) as well as the crushed garlic and minced ginger on deck for the sauce. 2. Sauté the broccoli briefly in a bit of peanut oil. This was simply because I anticipated it would take longer for the broccoli to cook due to the fibrous stalks. Alternatively, you can briefly blanch the broccoli prior to sautéing with the other vegetables. Do not overcook. 3. Prepare the sauce, adjusting the seasonings toward heat or sweet to your preference. 4. Sauté the remaining vegetables until crisp-tender, adding a bit more peanut oil if needed. Add the sauce and simmer briefly until vegetables are cooked, then stir in the nuts to heat through. Note: While I like things saucy, this recipe makes enough for another day depending on how many servings you are making, so use only the quantity you need/want. 5. 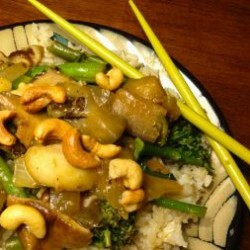 Serve over brown rice; garnish with additional cashews. If you’ve never tried it, you’ll find that using chop sticks will help you eat more slowly, a helpful strategy in managing weight as it gives your body time to recognize satiety cues; you can achieve the same thing by eating mindfully with a fork. So next time you have a craving for Chinese food, put down the phone and pick up the wok to whip up a version all your own that’s better for you, better for the planet, and utterly delicious. Note: This post was updated on 19 August 2013 with better photos of the final dish, so you might catch that this version doesn’t have red peppers since I haven’t been able to find any recently at the market. But it’s every bit as delicious, albeit not quite as colorful. How do you make the sauce? What ingredients?